Jannes Jan Labushagne captained South Africa A on tour in Europe last year and has developed into one of the Springboks' most complete forwards. Versatile and talented, he can play in the second or back row. 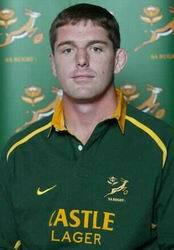 Educated at Rand Afrikaans University, he was a member of both the Vodacom and Currie Cup winning Lions' teams of three years ago. He is an accomplished guitar player and has deferred his studies in optometry while pursuing a burgeoning rugby career.